The battle over the sale of the Confederate flag at the Lorain County Fair reached yet another peak after a vandal posted a Confederate flag on a billboard protesting its sale. 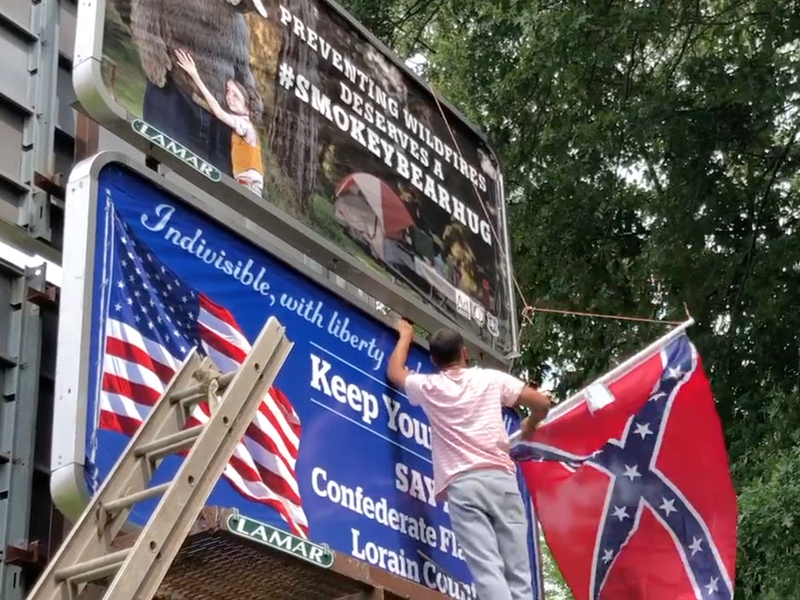 The billboard is one of three purchased by the Fair Minded Coalition of Lorain County which urges residents to "say no" to the sale of the Confederate flag at the fair. Coalition member Jeanine Donaldson said she believes someone posting the flag on a coalition billboard is further proof of how it divides a community. "To my family and other African-Americans it symbolizes hate, torture and terror," Donaldson said. "It's a right and wrong situation in the year 2018." Lorain City Councilman Angel Arroyo said the Lorain County Fair Board needs to finally ban the sale of the Confederate flag because it doesn't represent Ohio or his community. "It's a sign of ignorance and hatred of people in our community," Arroyo said. "It's frustrating putting this flag on the billboard. It's a sign of disrespect and truly shows the true colors of racism and hatred." But Lorain County Fair Board President Kim Meyers says the Confederate flag has been sold at the fair for 30 years. Currently, it's being sold by one vendor who is selling the flag as part of a wide variety of Civil War memorabilia. Meyers said to restrict the sale of the flag would be a violation of First Amendment rights. "Here at the fair, probably 99 percent of the feedback that we received has been in favor of the fair allowing for the sale," Meyers said. "The Ohio Fair Managers conference back in 2016 voted unanimously, there were 88 counties and seven independent fairs, that voted to allow the sale of that." Still, Donaldson said her group will continue to protest, and said more efforts to stop the sale of the Confederate flag at the fair will be unveiled in the coming months. "We're not going away," Donaldson said. "This is not about politics, it's just the right thing to do."